2کارشناس ارشد بیوتکنولوژی کشاورزی، بخش تحقیقات کشت بافت، شعبه مشهد، پژوهشکده بیوتکنولوژی کشاورزی ایران، سازمان تحقیقات، آموزش و ترویج کشاورزی، مشهد،‌ ایران. 3دکترای جنگلداری، بخش تحقیقات کشت بافت، شعبه مشهد، پژوهشکده بیوتکنولوژی کشاورزی ایران، سازمان تحقیقات، آموزش و ترویج کشاورزی، مشهد،‌ ایران. زعفران گیاهی تریپلوئید است که منبع متابولیت‌های ثانویه و یکی از مهمترین محصولات اقتصادی و دارویی ایران می‌باشد. در این مطالعه تکثیر درون شیشه‌ای زعفران با استفاده از دو روش مستقیم و غیرمستقیم مورد بررسی قرارگرفت. قطعات بنه که به‌عنوان ریزنمونه مورد استفاده قرار گرفتند، پس از ضدعفونی به محیط کشت MS با غلظت‌های مختلف هورمونی مربوط به باززایی مستقیم و غیر‌مستقیم منتقل شدند. تیمار کلرید جیوه 15/0 % به‌مدت 20 دقیقه بهترین تیمار برای ضدعفونی زعفران بود. نتایج حاصل از تجزیه واریانس داده‌های باززایی مستقیم نشان‌داد که بیشترین بنه در محیط BAP mg/l2 تشکیل می‌شود. مقایسه میانگین‌های درصد القای کالوس‌ بیانگر تفاوت معنی‌دار بین تیمارهای مورد استفاده در سطح 5% بود. کالوس‌زایی یک هفته بعد از کشت آغاز شد و بهترین محیط برای القای کالوس محیط mg/ l 2,4-D 1 + mg/ l BAP2 شناخته شد. بیشترین تعداد رویان در محیط MS با غلظت کم NAA (mg/ l 15/0) تولید شد. نتایج حاصل از بررسی جوانه‌زنی رویان‌ها نشان‌داد که دربین محیط‌های مورد استفاده محیط MS باmg/l NAA 15/0 بهترین تیمار برای جوانه‌زنی بود. تشکیل بنه تنها در محیط mg/ l 2,4-D 1 + mg/ l BAP 2 مشاهده‌شد. بنه‌ها برای سازگاری به جی فی منتقل و سپس به‌گلدان و خاک انتقال یافتند. 2MSc, Biotechnology, Post Address: Tissue Culture Research Department, Mashhad Branch, Agricultural Biotechnology Research Institute of Iran, Agricultural Research, Education and Extension Organization (AREEO), Mashhad, Iran. 3MSc, Forestry, Post Address: Tissue Culture Research Department, Mashhad Branch, Agricultural Biotechnology Research Institute of Iran, Agricultural Research, Education and Extension Organization (AREEO), Mashhad, Iran. Saffron (Crocus sativus; Iridaceae) is an important economic and medicinal crop in Iran. The saffron that is an herbaceous triploid geophyte is used mainly as a source of secondary metabolites having aromatic and medicinal value. The plant develops annually from buds on the mother corm – i.e. a thickened stem - which acts as a resting, perennating storage organ. In this research in vitro propagation of Crocus sativus through direct and indirect methods has been studied. Corm slices as explants were sterilized and transferred to MS media with different concentrations of plant growth regulators. The results showed that use of HgCl2 0.15% for 20 minutes is the best treatment for sterilization. The results of ANOVA of direct regeneration indicated that the most corm formation was observed in 2 mg/l BAP. Maximum callus induction was achieved on MS supplemented with 1 mg/l 2,4-D + 2 mg/l BAP. As results indicate the most number of embryos were obtained in MS medium containing 0.15 mg/ l NAA. Also this medium was suitable for germination of embryo. Corm formation was only observed in MS supplemented with1 mg/l 2, 4-D + 2 mg/l BAP in the indirect method. The corm was transferred to JF pot for adaptation and then it was transferred to the pot and soil for growing. Abdullaev, F.I. 2002. Cancer chemopreventive and tumoricidal properties of saffron. Experimental Biology and Medicine 227 (1): 20-25. Assareh, M. H., Ghorbanli, M., Akbari Khabbaz, M., Ghamari Zare, A., and Emam, M. 2007. Micropropagation, organogenesis and using photoototropic method in Eucalyptus gongylocarpa. Pajoohesh and Sazandegi 75: 135-145. (In Persian). Bagheri, A., and Safari, M. 2004. Plant Tissue Culture. publication of Ferdowsi University of Masshad. 406 pp. (In Persian with English Summary). Bathaei, S.Z., and Mousavi, S.Z. 2010. New applications and mechanism of action of saffron and its important ingredients. Critical reviews in food science and nutrition 50 (8): 761-786. Behnia, M.R. 2008. Assessment of effect of cultivation method of corm on saffron yield in Damavand. Pajoohesh and Sazandegi in agronomy and horticulture 79: 101-108. (In Persian with English Summary). Blazquez, S., Piqueras, A., Serna, M.D., and Casas, J.L. 2004. Somatic embryogenesis in saffron: Optimisation through temporary immersion and polyamine metabolism. Acta Hortculturae 650: 269-276. Ebrahimzadeh, H., Rajabian, T., Karamian, R., Abrishamchi, P., and Sabora, A. 2006. 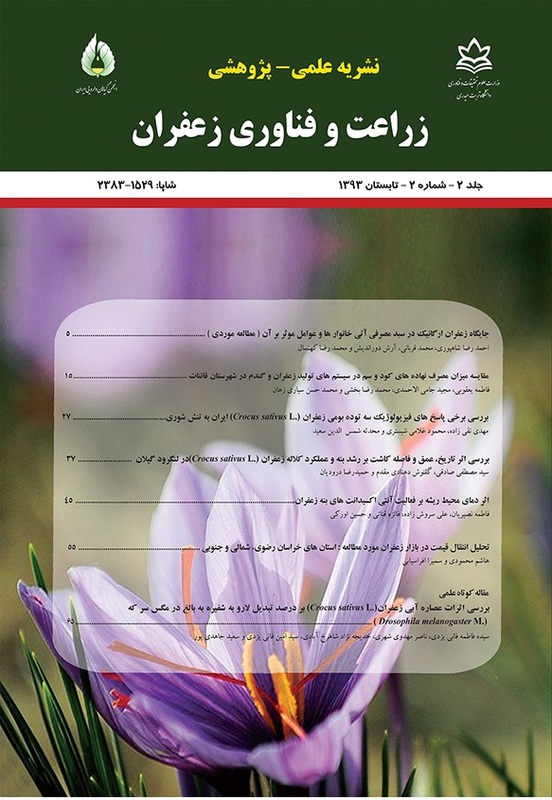 Iranian Saffron, Information Publication, Tehran. (In Persian). Fernandez, J.A . 2004. Biology, biotechnology and biomedicine of saffron. Recent Research. Development of Plant Science 2: 127-159. Ghalavand, A., and Mazaheri, D. 2000. Temperature effect on flowering and potential of Iranian saffron. Pajoohesh and Sazandegi 4: 65-69. (In Persian with English Summary). Grieb, B., Schfer,F., Imani, J., Mashayekhi, K. N., Arnholdt-Schmitt, B., and Neumann, K.H. 1997. Changes in soluble proteins and phytohormone concentration of cultured carrot petiole explants during induction of somatic embryogenesis. Journal of Applied Botany 71: 94-103. Grilli Caiola, M. 2004. Saffron reproductive biology. Acta Horticulturae 650: 25-37. Karamian, R. 2004. Plantlet regeneration via somatic embryogenesis in four species of Crocus. Acta Horticulturae 650: 253-259. Karaoglu, C., Cocu, S., Ipek, A., Parmaksiz, I., Uranbey, S., Sarihan, E., Arslan, N., Kaya, M. D., Sancak, C., Ozcan, S., Gurbuz, B., Mirici, S., Er, C., and Khawar, K. M. 2007. In vitro micropropagation of saffron. Proceeding of the second international symposium on saffron biology and technology. Acta Horticulture 739: 223-227. Khorrami, A., and Safarnejad, A. 2011. In vitro selection of Foeniculum vulgare for salt tolerance. Notulae Scientia Biologicae 3 (2): 90-97. Mehrdad, M. 2010. The study of Tilla begonifolie micropropagation in vitro. Thesis submitted in partial fulfillment of the requirements. For the degree of M.Sc. in. Silviculture and Forest Ecology. 67 pp. Mollafillabi, A., and Shoorideh, H. 2009. The new method of saffron production. 4th national festival of saffron. 27-28 october 2009. Iran. 38 pp. (In Persian). Omidi, H., Naghdi Badi, H.A., Golzad , A, Torabi, H., and Footou Kian, M.H. 2009. The effect of chemical and biofertilizer source of nitrogen on qualitative and quantitative yield of saffron. Journal of Medicinal Plants 8 (30): 98-109. (In Persian). Ommati, A., Farshadfar, E., Ardekani, M.R., and Naserian, B. 2006. Effect of cold pretreatment and filter paper in regeneration of canola haploid plants. Ninth Congress of Agriculture Sciences and Plant Breeding. Parray, J.A., Kamili, A.N., Hamid, R., and Husaini, A.M. 2012. In vitro cormlet production of saffron (Crocus sativus l.) and their flowering response under greenhouse. Genetically modified crop and food 3 (4): 289-295. Raja, W., Zaffer, G., and Wanti, S.A. 2007. In vitro microcorm formation in saffron. Proceeding of the second international symposium on saffron biology and technology. Acta Horticulture 739: 291-301. Rajabpoor, S., Saboora, A., and Vatanpour Azghandi, A. 2011. Changes in exogenous hormone concentration and its effect on somatic embryo maturation and microcorm of saffron. Journal of plant biology 8: 41-58. Safarnejad, A. 2015. Effect of growth regulators on in vitro regeneration of Ziziphus jujube. Iranian Journal of Rangelands and Forests Plant Breeding and Genetic Research 23 (1): 40-48. (In Persian with English Summary). Salopek-Sondi, B. 2004. Silver nanoparticles as antimicrobial agents: a case study on E.coli as a model for gramnegative bacteria. Journal of colloid and interface science 275: 177-182. Sepaskhah, A.R., and Kamgarj-Haghighi, A. 2009. Saffron irrigation regime. Journal of plant production. Vol3. (In Persian). Sharafzadeh, S.H., and Khoshkhooy, M. 2004. Effects of precooling and growth regulators on micropropagation of estahban saffron. Iranian Journal of horticulture science 5 (3): 129-136. (In Persian). Sharma, K.D., Rathour, R., Sharma, R., Goel, S., Sharma, T.R., and Singh, B.M. 2008. In vitro cormlet development in Crocus sativus. Biologia plantarum 52 (4): 709-712. Sheibani, M., Azghandi, A.V., and Nemati, S.H. 2007. Induction of somatic embryogenesis in saffron using thidiazuron. Pakistan Journal of Biological Science 10: 3564-3570. Vessal, S.R., Bagheri, A., and Safarnejad, A. 2002. The possibility of in vitro haploid production in chickpea (Cicer arietinum L.). JournalofScienceandTechnologyofAgriculture andNatural Resources6 (2): 68-76. Winterhalter, P., and Straubinger, M. 2000. Saffron-renewed interest in an ancient spice. Food Reviews International 16:39-59. Yilderim, E. 2007. Development of in vitro micropropagation techniques for saffron (Crocus sativus L.). Biology Master's Thesis. Middle East Technical University. 76 P.